Active-Schools-Flag | St Brigid's Boys' N.S. 2nd Class have been busy working on their throwing skills. The boys in junior infants had great fun learning all about Autumn and celebrating Halloween at St. Brigid's this year!! Have a spooky Halloween from everyone in Second Class! 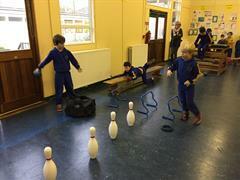 Ms Sheehy's boys have had a very active beginning to Second Class.